How many blogs does it take to get to the settlement table? The home was listed January 22nd. The contract was ratified January 30th. And today February 29th... yes it is leap year, we had a perfect settlement. Thirty eight days but who's counting. In the photo above, Leroy McLean(buyer agent), the excited new home owners the happy sellers Jimmy and Dan with me. Dan is holding the check and I am passing the keys. This transaction was perfect from the beginning. Great sellers, great buyers and a very competent professionals all working together. Thanks to Tom Shea, Sr. Loan Officer 1st Mariner for getting this FHA loan through in record time and we appreciate Kim Gavlin Owner, KG Title Inc. for accomodating our schedules. It is the definition of TEAM...together each accomplishes more! Below are the NINE blogs that got us from listing to settlement. Blog #7 Clear To Close' Are Meaningful Words! 'Clear To Close' Are Meaningful Words! Here are some meaningful words that I like to use. NEXT , WIN= What's Important Now? and I Don't Do Upset! Today's favorite line is Clear to Close. We had our Final Walk Through at 8930 Church Lane 21133 and settlement scheduled for Wednesday at 2PM. Last minute follow up with lender and title company for updates... these were not the words I wanted to hear, "We are waiting for a "couple more bits of information from the buyer"! Uh oh.. red flag! Can we close on time? A quick call to my sellers to alert them of a possible delay. Why wait til the last minute to share bad news? They are prepared but not thrilled. About 5:06 (but who is counting) an email arrives with a final approval and those very special words..Clear To Close. The funds have been wired to the title company and I have a preliminary settlement sheet. I will feel better when I have a final HUD1 but for right now... ''CLEAR TO CLOSE'' are meaningful words. What are some of your meaningful words? You all know that I have the best sellers. We choose each other and we are 100% Sure we want to work together. 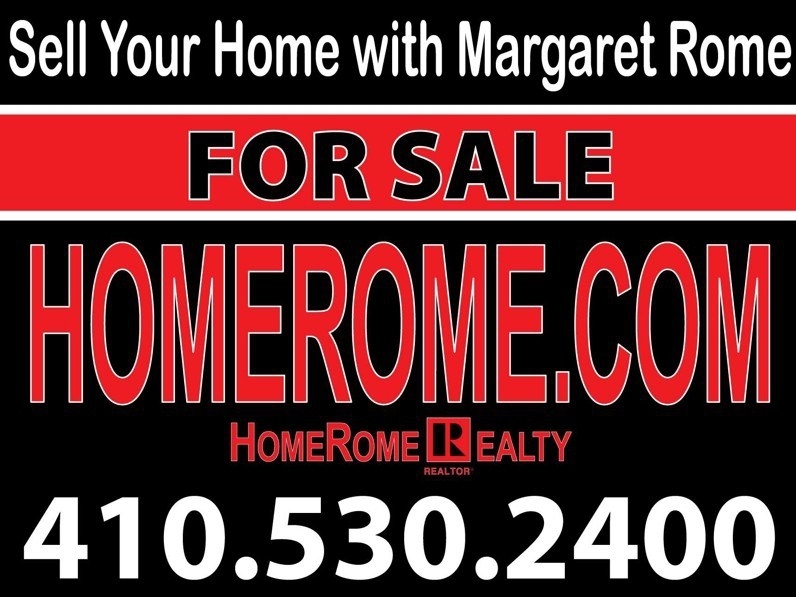 My favorite clients said there were 10 reasons to use Margaret Rome. I think they liked my blogging and I did sell their home on the first showing. Today was the final walk through at 8930 Church Lane. We all met at the property... myself, the buyer's agent, the excited buyers and the homeowners. Our Maryland contract allows for a final inspection within five days of closing. Most times this process is very short. There is a checklist to make sure any needed repairs are done. The buyers go around and turn on the water, the stove, the dishwasher, disposal, flush a couple of toilets, sign the addenda saying everything is satisfactory and say ''see you at the settlement table." This was not that kind of walk through. It started at 2:00 PM and finished after 4:00 PM. We had the most fascinating tour of the lush landscaping or as lush as it can be in the winter. 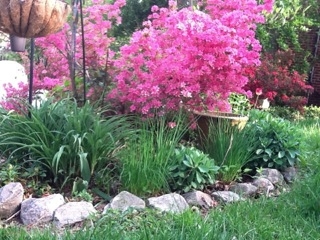 Everything planted on this half acre lot was done using specimen plants, trees, shrubs or flowers. The buyers got a preview of their gardens and are anticipating the beautiful spring season in their new home. This is such a perfect time to move. They continued sharing info on the items in the backyard oasis...from the Tiki bar (and location of the extra fuel for these torches) to how to change the filter on the pond and where to purchase the fish. The plantings all had a reason...to give privacy, to give color, to add fragrance but most of all to share nature's beauty! When it was time to go inside, the home was toasty warm from the gas fireplace. Each item was explained. These sellers had taken time to make up Three Ring Binders...one contained all the manuals and the other all the documents for 8930 Church Lane 21133 Baltimore county's Newest Historic District . Everything in one place and so convenient. My seller, being a horticulturist took time to point out each and every tree, when they bloomed, what color, described the flowers, how /when to trim, and even the fragrance of each tree or shrub. One he said smells like cotton candy... another was lemon scented. There were chairs and benches to relax and take in the aroma and solitude of the gardens. The tour continued, inside,on all four levels sharing the various features and upgrades and answering any and all questions. The buyer was taking notes writing as fast as possible. And the last thing the buyers saw..a wine cooler installed with a sign that read "Welcome Home" a gift from the sellers. The last thing I saw were big smiles on the happy buyers! The Cleaning Crew...Was Taking Care of Business! Had a showing at one of my new listings and upon arrival the "cleaning crew" was there. Not the workers we might have expected. There was a deceased opossum in the street and these guys were taking care of business. Reminded me of the last time I saw these thoughtful ole buzzards. Took a few photos of the road kill but decided it was a bit too graphic. ACC Craft Show Baltimore 2012..More Than Eye Candy. The Craft Show is in Baltimore this weekend and it is bigger and better. With over 700 exhibitors, it may be the largest indoor craft show ever. Everywhere you look there is beauty, eye candy, creativity and an excitement listening to the artists. There was lots of positive energy and people were buying. I have been going to these shows for many years and way before real estate. Was able to see quite of few artists from previous years and prior posts. Susan Provda was proud to be featured in The Baltimore Sun. Her specialty is hand made brushes. Take a look at Susan's earring! Tom Clark has a way with exotic woods. Here is his Ulu knife with holder...a must in any chef's kitchen. Textiles and lots of them. Here is a custom made throw by Loomis. Eugene Watson was delighted to see his hand sculptured jewelry boxes featured on my post about last years show. Another good use of my iPad. Chandelier made of wine bottles. Good way to repurpose your glass bottles. I found Susan Sanders and her "Silkworms." These very unusual necklaces are crafted of multiple silk strands and have a hand-made magnetic closure. Put it on and click, you're ready to go. 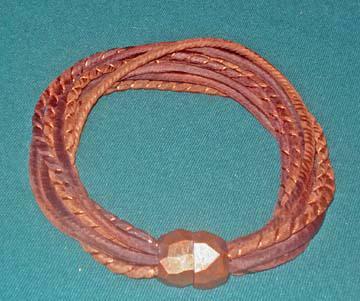 I own this one-of-a-kind in tones of browns, of course, with gold/bronze threads. My favorite clock maker Leonie Lacouette again has her beautiful timepieces on display. Single Family Home In Baltimore for Under $75,000! A Single Family Home In Baltimore for Under $75,000! Ideal for hospital personnel... within walking distance to Sinai Hospital where I was a former RN. 2804 Woodland Ave Baltimore, MD 21215 is ready to go on the market. Located in the Cylburn area of Baltimore City. Here is your chance to own a Single Family cape cod with two bedrooms on the first level and a large finished attic (29" x13") that could be a third bedroom, recreation room, studio or office. You read that right! I have a single family home for under $75,000. Please call me at 410-530-2400 for more information or to tour this cape cod home. Perfect starter home or investment property. I Go Nowhere without my camera. Just read a featured post by Jeff Dowler ... your camera ...a best friend. This is especially true in real estate. My camera goes everywhere with me and it is definitely my best friend. I remember to keep a charger with me at all times. Just today on a listing appointment, after taking photos of the Baltimore home, my camera was a portable copier. Took a photo of the plat and driver's license so I would have seller's ID in my file. Then I went to a lecture and took photos of the speaker, her signature to me in her book and her slide presentation. After that, it was out to lunch where I photographed the waitress, the restaurant and, of course, the food. All of the above will be future blogs. My camera is a great tool for the memory. I take a close up of the house numbers and street signs. No forgetting which property the photos belong with. About a year ago I was thinking about having my camera ready in Baltimore. There was a time when I made picture words with my camera. Thanks to Jeff for the inspiration. I go nowhere without my camera! We have found the perfect buyers for this beautiful Greencroft home in Hunt Valley. Rarely available...this exciting custom built brick, stone and cedar five bedroom two story contemporary sits on a 2.15 acre lot and has the right combination of lawn, landscaping and wooded areas. Being a landscape Architech, the new buyers love the home as well as the land. There are many luxury upgrades in this property. This serene community is filled with friendly neighbors and activities for children and adults. There is tons of open space, a children's play group, a women's club, a community pool... all this for a modest $1400 a year association dues and the privilege of living in Greencroft. This is Such a Pretty Living Room. 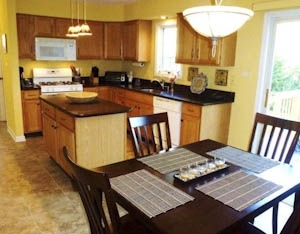 Spacious Kitchen with lots of cherry cabinets. The new buyers climbed into tree house! Bullhead City Area Commercial Investment Real Estate - Bullhead City Golf Course Luxury Homesite - 2982 Sidewheel Drive, Bullhead City 86429 - Laughlin Ranch Golf Course, River, Casino View Lot For Sale - CORVETTE OFFER! You can have a red corvette for $10.00. You read that right. Take a look at this wonderful marketing by Candice Donofrio. My friend Carra Riley knew what she was doing picking this dynamo broker to sell her property. Check out this golf course lot in Bullhead City, Arizona just across the Colorado river from Laughlin, Nevada. Wishing Candice and Carra a quick sale with one lucky buyer. Bullhead City Area Commercial Real Estate - Bullhead City Golf Course Luxury Homesite - 2982 Sidewheel Drive, Bullhead City 86429 - Laughlin Ranch Golf Course, River, Casino View Lot For Sale - CORVETTE OFFER! Laughlin Ranch is back, bigger and better than ever, market briskly rebounded on far more solid footing than before. Prices are literally HALF of what they were at the height of the market. And the five star resort-style living remains the best in the area. Your opportunity to acquire the BEST properties in Laughlin Ranchwill be a short-lived one, as the County records show a flurry of recent activity. If you move decisively NOW, however, you can live the dream that is Laughlin Ranch. 2982 Sidewheel Drive, Bullhead City 86442, located in Laughlin Ranch's prestigious Vistas is a hilltop view homesite that takes in not one but FIVE T-boxes on the championship golf course, as well as offering a bird's eye view of the Laughlin Ranch clubhouse, the upscale, elegant community's Grill (to die for chow), salon, mudroom, world class day spa, pro shop, banquet and meeting rooms, swimming pool, gym and workout facilities. The owner spent an additional $25,000 for custom house plans that are nothing short of breathtaking. IMAGINE THIS: The plans include a 3000 SF custom home with outside kitchen and bath in the pool area taking advantage of the mountain, T box and River views. The home also will have a formal dining area with fireplace, and a study with atrium garden area. The kitchen niche looks at the breathtaking view. The owner also paid $1200 for the HOA approval for the plans and additional amenities, such as an RV garage to go with the oversized garage. Did you know that parts of the movie "Escape From Witch Mountain" were filmed here? NOW, A 2002 RED CORVETTE WILL ALSO BE INCLUDED FOR 10.00 WITH ACCEPTED OFFER! Disclosure on Corvette Offer: For an acceptable offer to the seller on 2982 Sidewheel, a 2002 red Corvette will be transferred to the new buyer for $10.00 at closing. The seller will be offering the red Corvette on 2 other combination parcels of land: one in Lake Havasu City, AZ, and one in Yucca, AZ ONLY the first of the three listings of land with an acceptable offer can have the red Corvette for $10.00 at closing. Buyer must come and pick the red Corvette up or pay for transportation from Williams, AZ. Seller will not include owner carry terms if the car is included in the transaction. This AWESOME property is being offered for $111,111 AND the owner --one is an AZ RE Licensee is willing to get creative! Laughlin Ranch has never been more affordable. But it won't last forever. Still, if you act now, you could be spending part of the Summer of '12 at the River! This is a home I sold in 2009 and thought it was a terrific home. My seller is relocating and we put the house on the market the second week in January and now we have the perfect buyers. 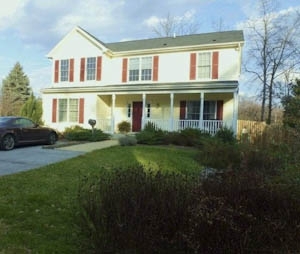 This beautiful colonial in Pikesville, MD is under contract and scheduled to go to settlement next month. The home was shown by a delightful buyer's agent..Pat Bronhoff, whom I met this past Thursday. Pat and I came into the business about the same time and have always wanted to do a transaction together. Now we get that chance. This home is not to be confused with 8930 Church Lane which is also under contract and closing in less than two weeks. Both of these homes will have new owners to enjoy Spring in Baltimore. I am one lucky mom! This past week I had the privilege of watching my beautiful talented daughter play Gilbert and Sullivan on her grand piano? 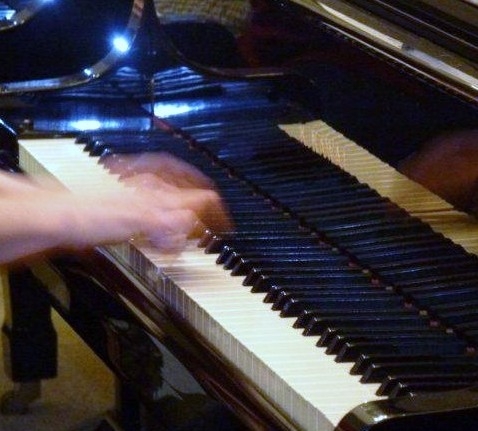 There were 25 -30 G & S singers from several states who came together with this music in common. It is all day of singing and laughing and lots of fun. Erica has organized several of these gatherings and is also the accompanist. I admire her amazing talent and skills. Love to watch her play. Love to hear her music. It was fun having my iPad downloaded with the music of Gilbert and Sullivan so I could follow the words and enjoy this talented group of singers and musicians. Thank you,Erica, for inviting Dad and I to join your party! 'I Like It Like That' ... by Hot Chelle Rae Went Platinum Today! 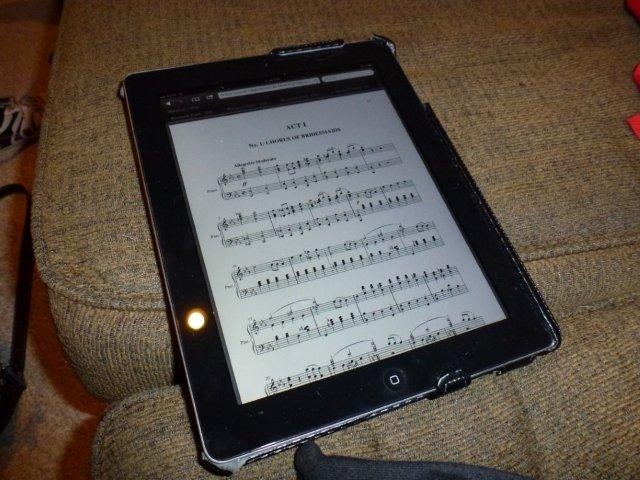 Recently wrote a post Share the Music Lady's Excitement! This was exciting for a teacher to have one of her students be part of a Jeopardy question. Quite a few years ago I listed and sold Sam and Anita's home and helped them purchase their dream home. We have kept in touch and these special clients have also become good friends. These are the same giving people who started Kids Helping Hopkins! "Hi!! Please allow me to share some more exciting news with you.... Just read a Facebook post from former Hernwood student Dan Book.... His song, "I Like it Like That", recorded by Hot Chelle Rae, went PLATINUM today!!! I may be an "oldie but goodie" music lady, but I must tell you that this song rocks....it is fabulous, and obviously 1,000,000+ thought the same thing and bought enough copies to make it Platinum!!! The group won Best New Artist at American Music Awards.......Congrats to Dan, his co-writers/producers, and the group....THANK YOU for letting me share this..... Think I'm gonna burst!!! Take care! Love, Anita"
It is such a treat to share the happiness of others.
' I Like It Like That' ... by Hot Chelle Rae Went Platinum Today.